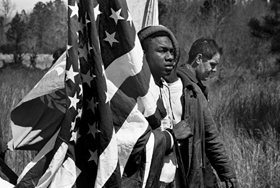 Alabama was the site of many key events in the American civil rights movement. Rosa Parks's stand against segregation on a public bus led to the 1955 Montgomery Bus Boycott, and the violence targeted toward the Freedom Riders of the early 1960s drew the nation's attention to racial hatred in Alabama. Protests led by Rev. Martin Luther King, bombings in Birmingham, and the pivotal march from Selma to Montgomery led the government to approve the Civil Rights Act in 1965.